I was really starving this morning (well, early afternoon) when I woke up. I knew I wanted something really filling and I immediately though of this post by Happy Herbivore and Catherine’s awesome signature breakfast. 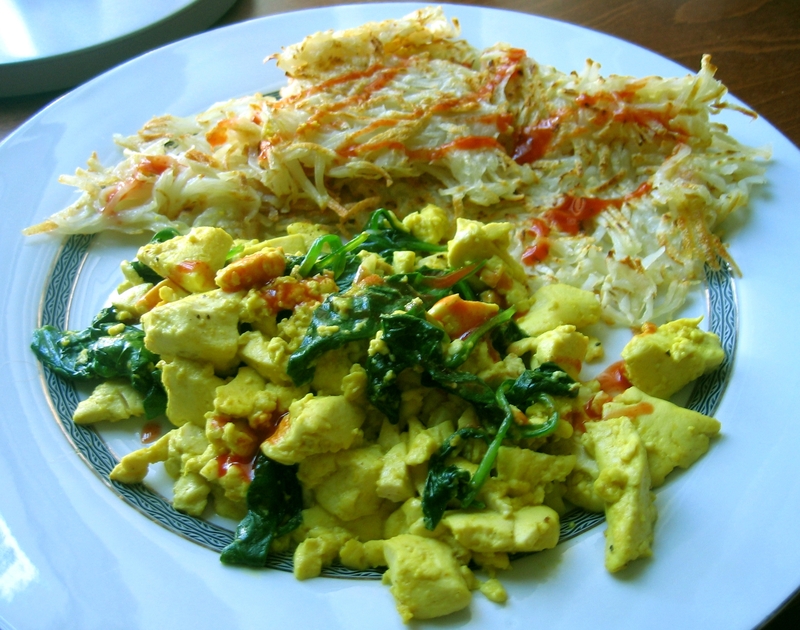 I decided on tofu scramble with sauteed spinach, hash browns and an apple. Catherine gave me some tips on making hash browns and I attempted some earlier in the week. I think I added way to much oil. Plus, I only have Russets and she recommends Yukon Golds. This time, I think they came out pretty well! The color on them isn’t very even, but they tasted good. 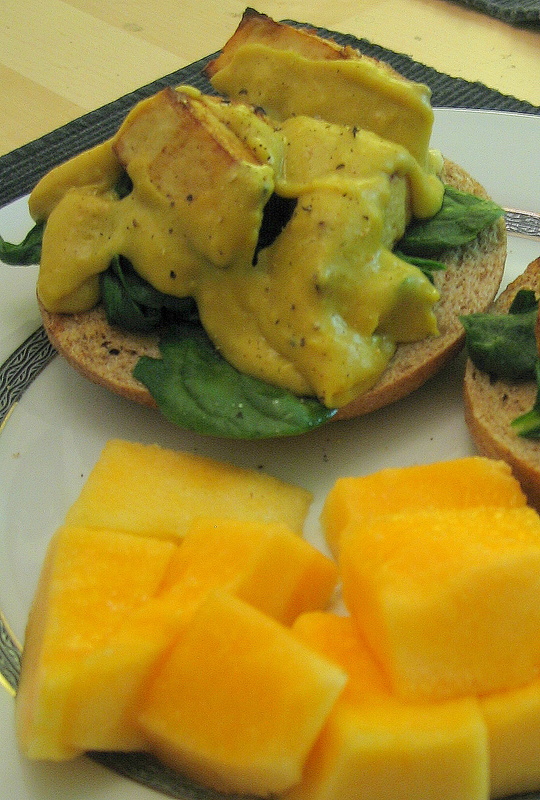 Once the farmer’s market has Yukon Golds again, I’ll definitely make some with those. As for the scramble, it was fabulous. I don’t have scrambled tofu all that often, but for some reason I was craving it! I used soft tofu (because that’s all I had) and added spinach sauteed with garlic. Thanks ladies, for your breakfast inspiration! This hungry-girl is officially full. Kelly over at The Pink Apron tagged me to share what’s in my freezer. I bet you can tell a lot about a person by what’s in their freezer. In my case, you can tell that I can be a bit unorganized at times because I had to clean and organize my freezer before it was pic ready. Eventually, I want to get one of those big freezers in addition to a regular fridge/freezer combo because my freezer is always overflowing! As you can (kinda) see, I have various bread products (spelt bread, whole wheat hamburger buns, tortillas) on top of the shelve. Tucked in the back are frozen beans (black beans and white beans) I’ve cooked from dry. Ground flax is in the contained up front. There are sweet potato fries on the side (they are really cheap at Target). 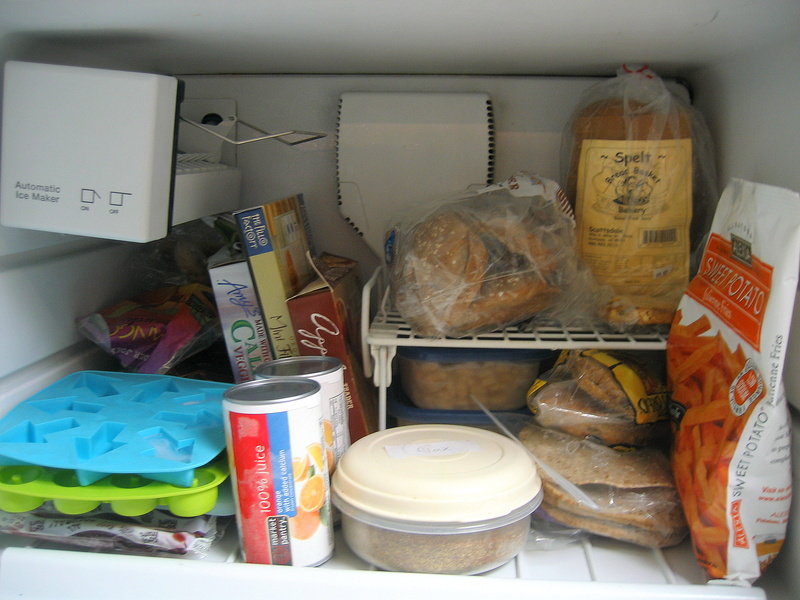 On the left side of the freezer there are various bags of frozen fruit (blackberries, cranberries, mango). Leaning on them are Amy’s California burgers, cute phyllo cups and vegan apple streudal from Trader Joes. In front of that stuff you’ll find ice cube trays, OJ concentrate and what we call popsies. 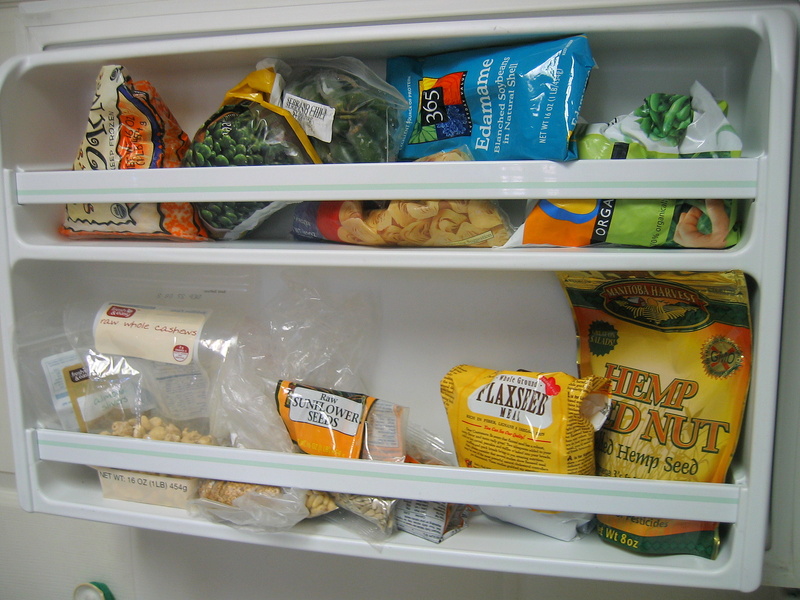 Living on the side shelves are frozen vegetables and nuts. If you haven’t showed the blogging world the contents of your freezer yet, consider yourself tagged! 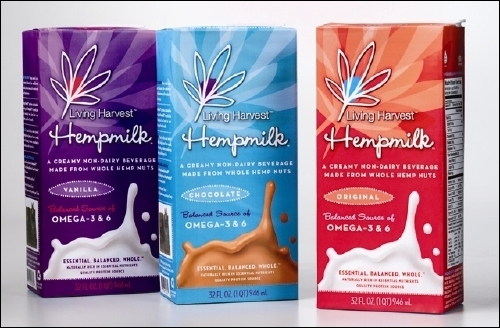 I’ve been wanting to try hemp milk for what seems like forever, but it is SO expensive. Usually is it $3.99 at my local health food store. Well, all that waiting paid off because it’s finally reasonably priced! It’s on sale for $2.50/quart AND each quart has a coupon for one dollar off two. So that means, $2.00/quart! Yes. Matt and I both loved the taste, so we stocked up in a major way. I think we bought something like 15 quarts…and I really want to buy more before the sale is over. In addition to the eggplant I got at the farmer’s market last Wednesday, I also got spaghetti squash. I have never eaten the stuff, but I was feeling adventurous. After researching cooking methods in my various cookbooks, I decided I would bake it in the oven. I split it in half first, gutted it and saved the yummy seeds (Jess loves squash seeds, too!). Then I put the halves cut side down on a sheet pan covered with parchment paper into a 350-375 degree oven for something like 30-35 minutes. Oh, and I rubbed the halves with a little olive oil first before going onto the sheet pan. The results amazed me even more than rising pizza dough! Holy crap-it looks just like spaghetti when you use a fork to scoop out the innards! 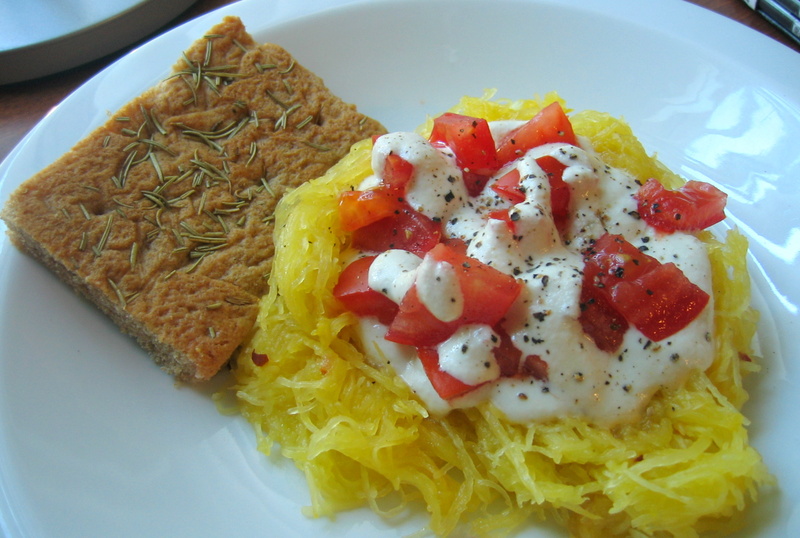 I have seen pictures of spaghetti squash strands on other blogs, of course, but I guess there is nothing like experiencing something for yourself! Since the squash looked like pasta, I wanted to eat it like pasta. I whipped up a quick cashew cream sauce (soaked cashews + water + garlic + lemon juice + lots of pepper) and topped everything with some tomato, from guess where?! The farmer’s market. I have a love/hate relationship with eggplant. I’ve had some successes when cooking eggplant (VCON’s Roasted Eggplant & Spinach Muffalatta) and many failed attempts (Eggplant Parmesan x 10). I also have had way to many greasy eggplant sandwiches from chain restaurants. When I went to the farmer’s market yesterday (as I always do on Wednesdays), my local grower told me that eggplants would soon be replaced with squashes and sweet potatoes. Eeek! While I love squash and sweet potatoes, it was the scarcity of locally grown eggplant that made me want it. So I bought a good lookin’ medium sized one. I was determined to search near and far for an easy, cheap and delicious recipe staring eggplant. I found some yummy looking recipes in VCON, but they we either too complicated than I was wanting or I didn’t have a lot of the ingredients. I turned to one of the cookbooks I just recently checked out of the library: Moosewood Restaurant New Classics. The recipe for Moroccan Roasted Vegetables quickly caught my eye! I then realized I had all of the ingredients except sweet potato (hehe) and zucchini. I decided the recipe would probably be just as good without them, so I got cooking. The result was a creamy, melt in you mouth eggplant that was beyond flavorful with the spice blend of cumin, turmeric, cinnamon, paprika and cayenne. I served the veg (and a handful of chickpeas) over couscous as suggested in the recipe and topped everything with toasted almonds. I just wish I had raisins-that would have put it over the top! 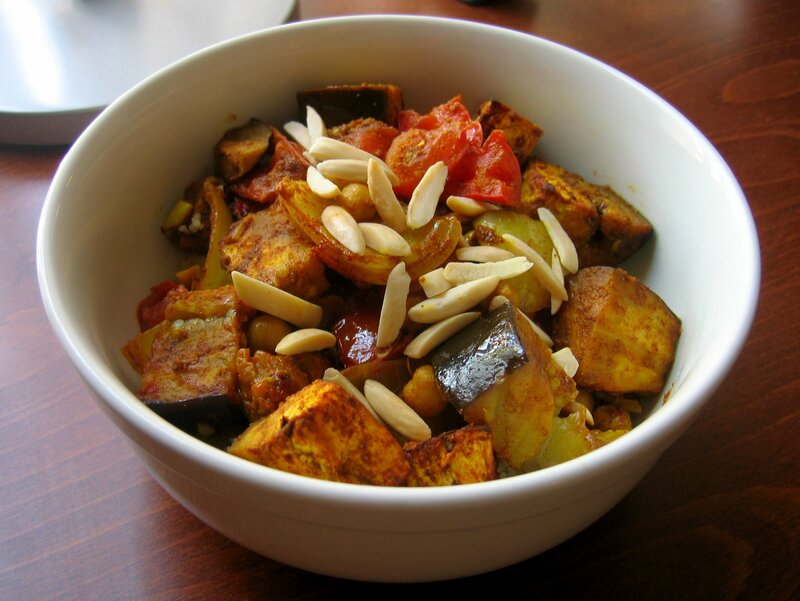 So eggplant haters, haterz, h8rz…whatever you call yourself, try this recipe and kiss and make-up with that purdy purple vegetable called eggplant. Tonight I had brunch for dinner, which is always fun. I made VCON’s Tofu Florentine. It was super easy to make, since I had cheesy sauce left over from the other day. This is one of those recipes that I’ve been meaning to try for forever! I’m glad I finally made time for some Florentine in my life cause it was goooood. Oats are awesome. Just say it. Many of my favorite baked goods (and some savory dishes, too!) 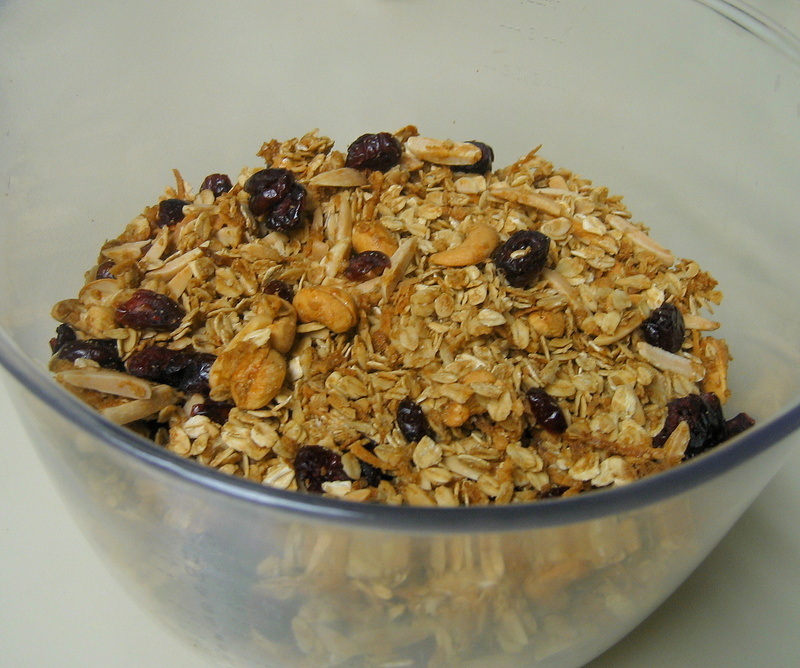 have oats in them. They are cheap, good for you and tasty.